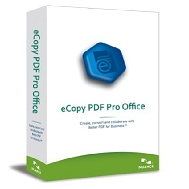 eCopy PDF Pro Office is Nuance's latest enterprise level desktop PDF software. Replacing the eCopy Desktop and eCopy Paperworks products, it is the cost effective alternative to the full Adobe Acrobat products. Create searchable PDF files straight from your existing TWAIN, WIA, or ISIS compliant scanner. Insert and Extract pages from existing PDF files, convert to secure and seachable PDF. Convert PDF files into fully editable Microsoft Word, Excel, and Powerpoint files. Compare PDF files for differences. Automatically highlight, cross-out, or black-out text via a search function. Download a 45-day trial of eCopy PDF Pro Office, or contact us for more information.